If you're from Lake Oswego and you're a high school football fan, you know what's up this week. At noon Friday, top-ranked Lake Oswego will square off against No. 4 Jesuit in the Class 6A state semifinals at Hillsboro Stadium. The Lakers are a great team and I am looking forward very much to covering that game. Needless to say, there will be a lot to say about Lake Oswego football in next week's paper. But for just a moment, before it diminishes further in the rearview mirror, I'd like to take one more look at this year's Lakeridge football season. In 2018, in head coach Elvis Akpla's fourth season, the Pacers proved themselves. They proved themselves in the non-league schedule, they proved themselves in the Three Rivers League and they proved themselves in the playoffs. 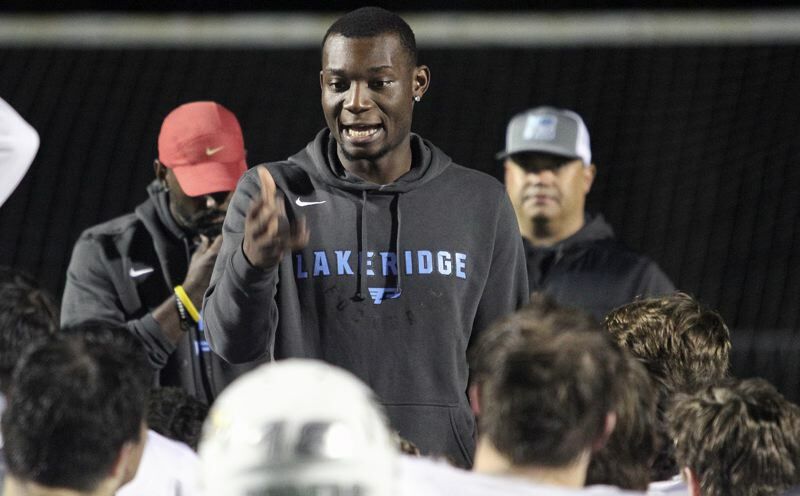 Any time you can say that many good things about a team, you know it was a good year, but what made 2018 special for Lakeridge is just how different it was from the seasons that preceded it. So for just a moment, let's crank up the old time machine and take a brief look back at what preceded Akpla's tenure as head coach. Five years ago in 2013, the Pacers were one of the state's best teams, a quarterfinalist with a D1 quarterback and a sparkling 9-3 record. But Lakeridge was also a team with a problem. The Pacers saw the end of their year marred by a nasty conflict between coaches Tom Smythe and Chad Carlson — a conflict that led to Smythe's departure from the team — and capped by a penalty-filled blowout loss at Jesuit. The team's ugly playoff defeat — the Pacers were whistled for 21 penalties (many of them personal fouls) for 229 yards — led to the program being fined by the OSAA, as well as the discovery that 14 of its coaches did not have their required certifications. A year later, after finishing fifth in league and reaching the second round of the playoffs, Carlson left the program. Those were dark days for the Pacers, and picking up the pieces to make something new was not an easy task for Akpla — a former Lakeridge star who had already assisted with the team for two seasons — and his assistant coaches. But now, with his fourth season as head coach just finished — the Pacers lost to West Linn in the second round of the Class 6A state playoffs on Nov. 9 — it's clear that those pieces are definitely fitting together at Lakeridge. Indeed, things began coming together in 2017, then accelerated in that process in 2018. In 2017, the Pacers snapped a 17-game Three Rivers League winless streak, reached the state playoffs for the first time since 2014, and at one point, put together three wins in four weeks in the always-tough TRL. The 2018 season was even better. The Pacers went 3-1 in non-league play, 3-2 in the Three Rivers League to tie for third, and won their first playoff game since 2014 (beating McNary 56-33). And while the Pacers will graduate an important group of seniors — including first-team all-leaguers Javier John (on the defensive line), Andre Martinez (at wide receiver) and Charlie Maynes (at quarterback) — there's a ton of talent coming back that point to more good things ahead and the overall health of the program. Junior running back Jalen John just completed an all-star season that saw him rack up 1,727 yards and 23 touchdowns on 210 carries. Junior Xander Houck will return at wide receiver after making 24 catches for 418 yards and three TDs. Junior quarterback Cooper Justice looks ready to take the reins at quarterback, and the team will also bring back all-leaguers Caiden Biege-Wetherbee, Hunter Daskalos, Keoni Hepa, Ty Glumbik, T.J. Jakmauh and Eric Reilly. So while we focus this week on Thanksgiving, holiday plans and Lake Oswego football, let's remember the many good things that happened at Lakeridge, too.